In 1934, with Philadelphia amidst the Great Depression, a survey of the city’s households found an astonishing number of homes lacked electricity, water, and heat. An estimated 152,022 Philadelphians had no bathing facility, 39,239 people were living without a bathroom, and 28,000 families were sharing single-family dwellings with another family. Two thirds of the city’s homes were close to 100 years old. Infectious disease was rampant in these overcrowded, unsanitary sections of the city. How had things gotten so bad? Fifty years before the Great Depression, in the late 19th Century Philadelphia was dubbed the “City of Homes.” Philadelphia was the second-most-populous city in the nation, and a high proportion of Philadelphians were proud homeowners, but growth posed new challenges for housing new residents. Between 1880 and 1930, Philadelphia’s population grew by over a million from 847,170 to 1,950,961. During the 1920s, the population boom and business development spurred real estate speculation and inflated land values. The Philadelphia Housing Association maintained throughout the ’20s that substandard housing would be improved by entrepreneurs and private investors. There was new construction at this time, but it was only affordable for the top third income earners. One of the problems with trying to encourage investment into the rest of the market was that Philadelphia’s working class was already struggling to find steady employment years before the Wall Street Crash on October 24, 1929. In April of that year, Philadelphia’s unemployment rate was 10.4%, and many others were underemployed. Land value was rising, and tenants were increasingly struggling to pay rent. Landlords held onto property with the intention of selling, and had no incentive to reinvest in improvements. By the time the Great Depression began in late-1929 Philadelphia’s housing problems had become a crisis. In past depressions Philadelphia relied on a system of volunteers and private philanthropists, but it had never faced a test like the Great Depression. Even as the resources of relief organizations were quickly outstripped in the first year of the Depression, the city’s political leaders were confident that volunteerism and philanthropy would address the needs of the unemployed. The city allocated just $150,000 toward unemployment assistance in 1930. Franklin D. Roosevelt was elected president in 1932, and as a part of the New Deal the Public Works Administration (PWA) was created in 1933. Philadelphia City Council approved a PWA housing development in Juniata Park that same year, but Moore vetoed it saying, “Philadelphia is a city of homes,” and bragged that, “a thousand cities and industries are appealing to the Federal Government for relief. Philadelphia is not among them.” Seeing Moore’s obstinate opposition, the PWA found a new, and rather unique, local partner: The American Federation of Full-Fashioned Hosiery Workers. 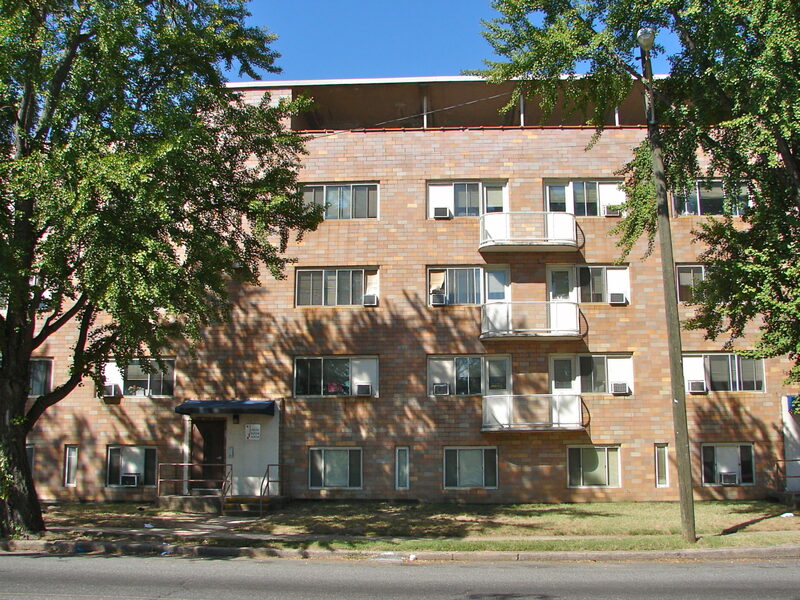 It was the first federally-funded public housing project in the nation. Construction began in 1933, and was completed in 1934. It cost $1,123,713 to build 284 apartments in four buildings over 5.5 acres. The development was dedicated to a union member killed during a 1930 strike. On January 3, 1935, the doors opened to Philadelphia’s newest and most modern housing project: the Carl Mackley Houses in Juniata Park. The Carl Mackley Houses reflected European architectural and social theory. The architects, Oscar Stonorov and Alfred Kastner, deliberately constructed the apartments to promote a communal atmosphere. 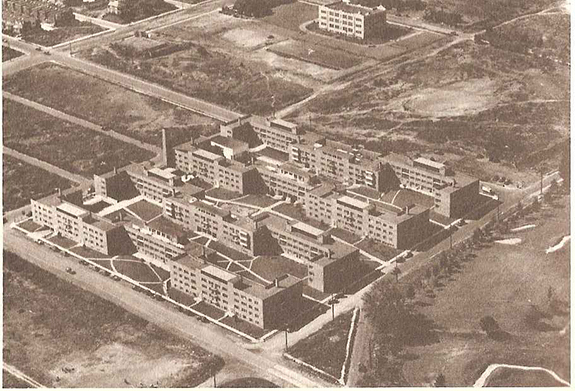 The facilities included a swimming pool, wading pool, roof terraces, play yard, nursery school, kindergarten, library, five stores, print shop, boys’ club room, carpenter shop, craft room, model shop, and an auditorium. 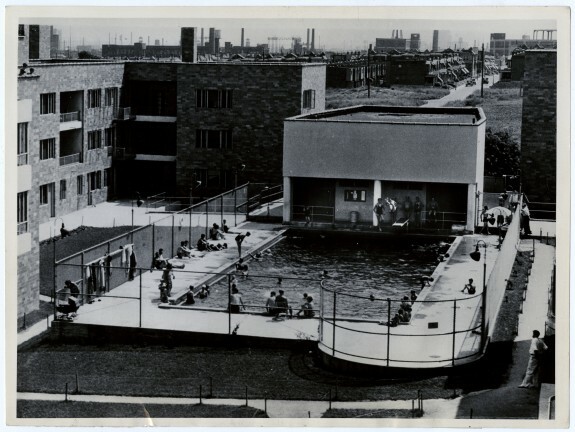 The apartments were also across the street from Juniata Park, which gave residents further access to picnic grounds, a golf course, play areas, a ball park, and a playground. In 1936, 50 to 60 percent of the residents were members of the American Federation of Full-Fashioned Hosiery Workers. Tenants paid a rent of $9.45 per room per month which included heat, electricity, refrigeration, cooking fuel, and laundry facilities. “The Carl Mackley Houses is primarily an experiment,” read a 1936 editorial in the resident newspaper, Mackley Messenger. “The social, intellectual and even political potentialities of such a community as ours are enormous, and if they are properly developed the power and prestige of the Labor Movement will be greatly enhanced.” The Mackley Messenger wasn’t wrong. The housing project was studied by the Federal Division of Public Works, which concluded that the communal design was a vital part of its success. As much as it was an example of modern and progressive New Deal housing, it was also an example of perhaps the biggest shortcoming of New Deal housing policy and the progressive movement of the time. The Carl Mackley Houses were built in a white neighborhood for white families. The PWA formed the Philadelphia Advisory Committee on Housing to direct local housing projects. The committee consisted of all white members. When questioned, Bernard Newman, the committee’s director, said, “since a black project had not been considered, the committee had not seen a need for a black member.” Although African American families were also struggling to find affordable housing, the PWA only constructed homes in white neighborhoods, and pursued policies to segregate African American families from those neighborhoods. It was a short-sighted a bigoted view that seemed the antithesis of the very experiment of the Carl Mackley Houses in which every part of the design was built to encourage the development of community and a supportive social structure. The Carl Mackley Houses were renovated in 1999. AFL-CIO President John Sweeney spoke at the re-dedication ceremony: “Both the old and new Carl Mackley are products of labor’s partnership with others in the community who share our vision of high quality housing that all working families can afford.” As a further testament to it’s designers and place in the city’s history the buildings were added to the Philadelphia Register of Historic Places in 1982, and the National Register of Historic Places in 1998. It was also recognized as a landmark building by the American Institute of Architects in 2000.